When it comes to Brunello producers, these two along with Biondi-Santi, Banfi, Soldera & a select few others consistently take it to the next level! As much as I detest scores when you see 100 points for a wine it’s worth a moment of pause before you move on. 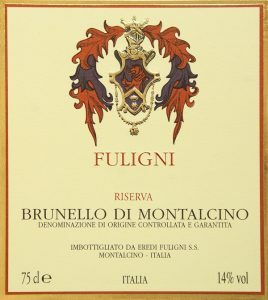 Today we offer the 2013 Brunello di Montalcino and 2012 Riservas from the Fuligni and Costanti estates. Seriously, how many wineries can say they were founded in the 16th century! 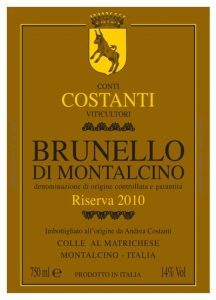 Brunello at it’s best is such a beguiling wine. 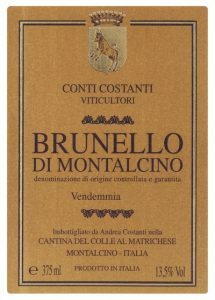 From Montalcino about 80km south of Florence in the Tuscany region, Brunello is the second highest classification, of the 100% Sangiovese wines made in the region. The Riservas being the highest. The fact that the current vintages are 2013 and 2012 respectively (as required by the DOCG) immediately signals that these wines spend more time maturing than many other Sangioveses from Tuscany. This élévage has a transformative effect on the wines, guiding them past adolescence to early adulthood. The rest is up to us! The great wines reward cellaring, yet, are immediately attractive. Both of these producers have a wonderful purity of fruit. The Costanti being aged in large botti heading down the more traditional style. Fuligni straddles the modern and traditional with use of some smaller oak from Allier seeing a lick of oak in the wine. The wines have the unmistakable imprint of the Matrichese cru, yielding Brunello of unparalleled elegance and complexity, with luscious focussed berry fruit, remarkable structure and above all, exquisite balance. The vines’ altitude (310-440 metres) is conducive to ideal ventilation and the warm days and cool nights result in wonderfully fragrant Brunellos. Unfortunately for wine lovers, there are only 10 hectares under vine and availability is subject to fierce demand from both sides of the Atlantic, hence the minuscule quantities. The video above explores the 2006 wine, it will give you some insight into the maker and the wines. It’s worth taking a look at this Wine Spectator Video for a bit of background on Fuligni. Enticingly fragrant, this opens with delicate scents of forest berry, underbrush, new leather and crushed purple flowers. Juicy and enveloping, the smooth, full-bodied palate presents ripe Morello cherry, raspberry preserve, licorice and chewing tobacco framed in taut fine-grained tannins. There's a very complex and fresh nose with elegant red cherries, spices and light herbal nuances. Smells very fresh. The palate has beautiful focus and depth with effortless rich dark and red cherries cast amid perfectly proportioned silk-smooth tannins. Long and so focused, the finish is superb. Try from 2022. Heady scents of chopped herbs, woodland berry, forest floor, new leather, dark spice and violet are just some of the aromas you'll find on this fragrant wine. It's savory and loaded with finesse, delivering juicy Marasca cherry, raspberry compote, licorice, orange zest and pipe tobacco alongside firm yet polished tannins and fresh acidity. A tangy mineral note graces the lingering finish. It's still young and needs plenty of time to fully unwind and develop. Drink 2027–2042.